First, download the free introductions to any of our Whodunit Games so you have a better idea of what's in them. Next, select and buy the one which best suits the private dinner party or other event you are holding. Download your Murder Mystery Game and print it out. Your Whodunit Kit contains the background story and rules of the murder game, hosting tips, clues, character information and easy-to-follow instructions for your Murder Mystery entertainment. Check with What To Do Before Your Event to make sure you've done everything you need to. 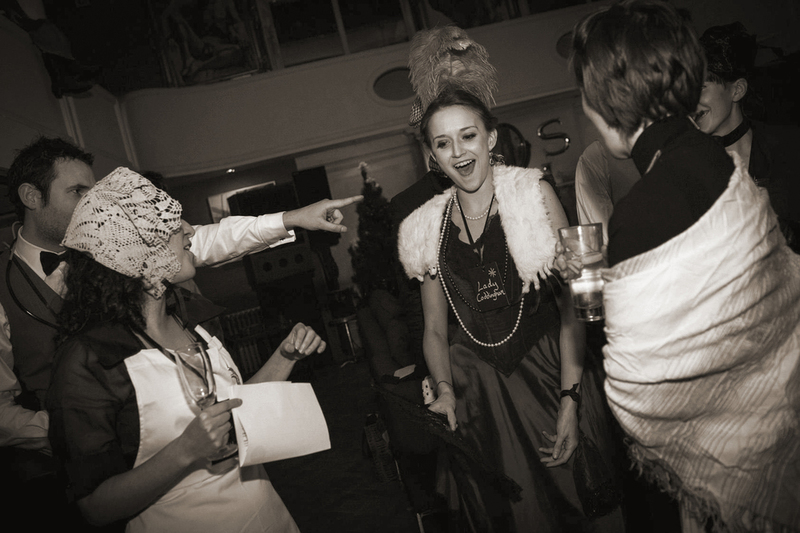 Now you’re nearly ready to run your own murder mystery party! You can run this lively, crime-solving entertainment in your own home or a venue of your own choosing. The plots are designed to work very well over a meal but can also be run on their own. Each party guest’s invitation includes a brief description of their character to help them decide what to wear and to prepare for the party. We have some costume suggestions which provide further help with this. Ahead of the event, you can plan where the “action” will take place and what food to serve (if it’s at home) or arrange this with your chosen venue. Because the plots are set in different historical periods, your food and drink choices can be made to match them. As the guests arrive, the host/hostess gives them a character name badge and more information about who they are, what they know and what their character wants. Some have secrets to hide, others secrets to share. Everyone has plenty to talk about and plenty of other players to speak to. One person is, of course, the evil murderer. The host/hostess relies on our downloadable step-by-step guide to make sure everything flows as it should. Best of all, running the game doesn’t mean you can’t get involved. Everyone has their own character to play. Murder Mystery Games are Fun! Some focus on trying to solve the murder. Others delight more in participating, playing a character and being dressed up. The Murder Mystery Party Kit you download indicates when and how the clues are revealed and how to moderate the pace of the party and its denouement.